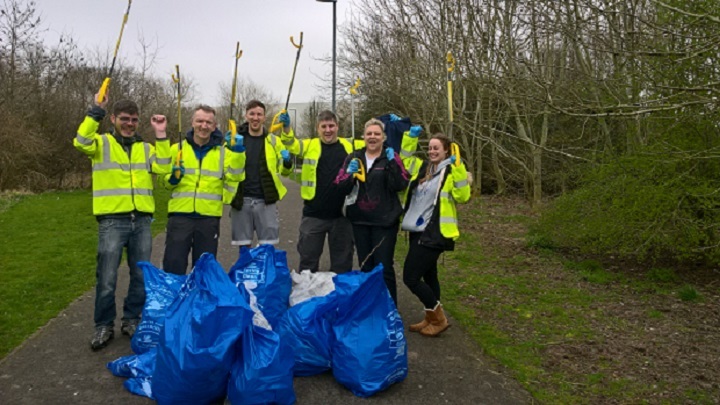 Nearly 100 volunteers defied the bad weather to turn out for Swindon’s Great British Spring Clean this year, collecting almost 150 bags of rubbish and recyclables and helping make Swindon a tidier smarter place. Billed as Britain’s biggest-ever community clear - up, the Great British Spring Clean ran from 3 – 5 March as a call to arms to get half a million volunteers out on litter-picks up and down the country. With Swindon Borough Council underpinning the event, teams who rolled up their sleeves included John Lewis Partnership, Nationwide, Raychem Fishing Club, Westlea Church as well as residents from Ramleaze, Nythe, Cheney Manor, Priory Vale, Park North, Walcot, Middleleaze, Lawn and Shaw. Council staff also volunteered in their home areas. Besides huge quantities of refuse being recovered, including tin cans, plastic bottles, fast food wrappers, soiled nappies, piles of wood and much more besides, other Items were more bizarre, ranging from scores of car tyres, hub caps, head lights and metal rods to signs, plastic trays, metal poles, and even a car bumper and exhaust! Swindon Borough Council gave full backing to the volunteers, loaning litter picking equipment, distributing Keep Britain Tidy branded bags to registered groups and individuals and removing the waste collected. “The response was magnificent and the Swindon community rose to the occasion, just as they did last year. It was a shame that the severe weather impacted on our turn out at the start of the campaign, but a number of individuals put a brave face on the rain and there was plenty of follow up after that. I’m grateful to our StreetSmart colleagues for sourcing the equipment. “Having also gone out on the clean-up, I saw for myself the hard work and commitment of everyone and the results were spectacular.